High bandwidths, sampling rates and a huge buffer memory, combined with mixed–signal capability and built–in AWG gives you class–leading performance at a price you can afford. Oscilloscopes in the PicoScope 3200 range all feature a high–speed USB 2.0 interface, together with impressive sampling rates, high bandwidths and a very large buffer memory. 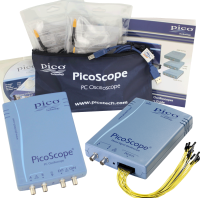 With bandwidths ranging from 60 to 200 MHz your PicoScope 3000 Series computer oscilloscope offers bandwidths previously unavailable in this price range. The high bandwidth is complemented by a market–leading 500 MS/s real–time sampling rate (most USB–powered oscilloscopes have real–time sampling rates of only 100 or 200 MS/s). ETS mode boosts the maximum effective sampling rate further to 10 GS/s, giving you a more detailed display of repetitive signals. Our high–performance two–channel oscilloscopes have buffer memories of up to 128 million samples — more than any other oscilloscope in this price range — so you can always sample at high rates regardless of the timebase. 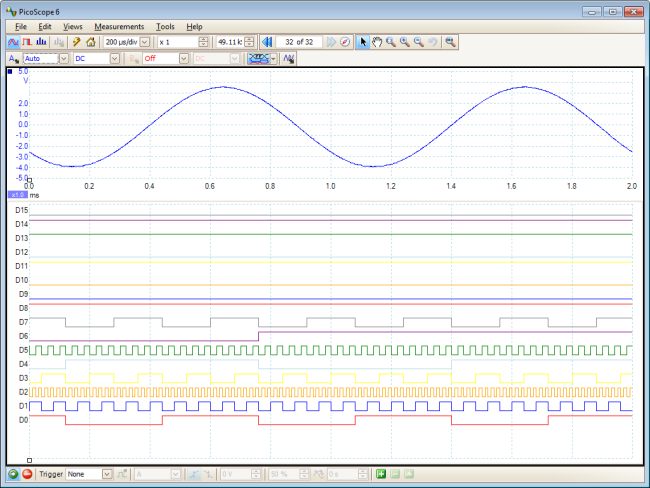 Along with two analog channels, Mixed–Signal Oscilloscope (MSO) models also have 16 digital inputs. The digital inputs of your PicoScope 3200 MSO can be displayed individually or in arbitrary groups labeled with binary, decimal or hexadecimal values. A separate logic threshold from -5 V to +5 V can be defined for each 8–bit input port. The digital trigger can be activated by any bit pattern combined with an optional transition on any input. Advanced logic triggers can be set on either the analogue or digital input channels, or both to enable complex mixed–signal triggering. 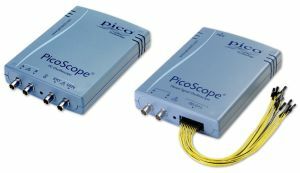 With an MSO model PicoScope you can view both digital and analogue signals simultaneously. I'm delighted with this USB based scope. The software is easy to use, the functionality is just what I wanted, the price is right, and it is lightweight.